Recently I have been spending my prayer time meditating on the different ways God has been described in scripture. There are some descriptions that we are all familiar with: God is love, light, and truth. Those make sense to me. There are some feminine descriptions that I personally treasure, but many people like to ignore: God is a mother hen, a woman in labor, and a woman who has lost her coins. There are also some unusual descriptions that intrigue me: God is a soothing aroma, clothing, and flame. But there is one description of God that I have found more baffling than the others: God is a rock. Go outside and pick up a rock – look at it for a moment. How is this God? I’ve spent the last two weeks considering this as I hiked in the Alps. The first day of hiking – covering a 3600 foot change in altitude over 13 miles of sometimes impossibly steep trail – gave me a lot of time to think. Though I hadn’t really planned any particular sort of meditation for my hiking, as I looked at my surroundings, I saw rock after rock after rock. So as I climbed, I begin to consider just what it meant that God is a rock. It was then I became aware of the many different ways that I was encountering rocks: A tiny rock that somehow fell into my boot that made me uncomfortable as it worked its way under my heel. A multitude of prayer rocks that hikers had stacked where the Weisse (White) and Sefinen (Black) Lutschine Rivers collide. A huge boulder that had fallen a great distance and taken down every tree in its path. I saw mountain peaks of solid rock covered with snow. I saw the ruins of an ancient castle built both upon a rock and out of rock. I became more aware than ever that rocks had different textures and colors. I saw rocks through which water had carved out a cave. One night, my husband and I starred at the sheer face of the Black Monk from our bed naming the shapes we could see in the rock. He saw an elephant. I saw a dancing alien. We took pictures of rocks in the sunrise, in the sunset, and in the brilliant noonday sun. There were rocks, like the Eiger, which are too dangerous to climb. And rocks that humans had formed into fences to keep the unwanted (perhaps human – perhaps beast) in or out. We sat on rocks, stood on rocks, and stumbled over them. Rocks were everywhere! In the end, I wondered if God wasn’t all of these things. From a castle fortress that protects me to a tiny pebble in my shoe that makes me uncomfortable until I address it. It occurred to me that just as my husband and I both saw different things in the moon light shinning on the Black Monk, doesn’t God appear to us each differently at different times? To Moses as a burning bush and to Elijah as a small still voice? We often use God to create “rock” fences that keep us isolated from one another. And how many times have I stumbled over God either when I least expect God to show up or when I am pretending God isn’t there? What I learned most about rocks was that the big magnificent ones take patience and skill to climb. New skills are learned each day. Sometimes it helps to have a guide. 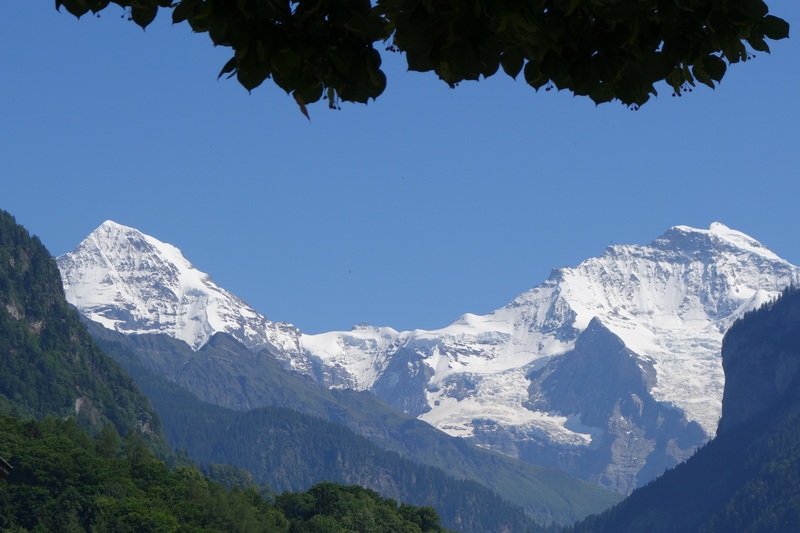 And some, like the Eiger, are just too dangerous to climb – perhaps these impossible rocks are there to remind us that we are finite, but God is infinite and that we will never experience all there is to know about God. God is a rock! No, wait. God is my rock! April describes herself as a Red Letter Christian who writes about scripture and spiritual disciplines. See her latest book, James in the Suburbs: The Disorderly Parable of the Epistle of James. Great for an individual read or group Bible studies! ← My Grandfather’s Grandfather had Slaves. We neglect some of names because we are uncomfortable with them. Thank you for bringing those out again.